If you are one of the many taxpayers who requested an extension from the Internal Revenue Service (IRS) on filing their taxes earlier this year then your time is almost up. A filing extension is an exemption made to both individual taxpayers and businesses that are unable to file a tax return by the due date (approx. every April 15th). Individuals must have completed and filed IRS Form 4868 by the regular date of their return, however, for an automatic six-month extension. Third-quarter estimated tax payments due for 2017. Final deadline to file individual tax returns for 2017 (Forms 1040, 1040A, 1040EZ). Final deadline to file C-Corporation tax returns for 2017. Final deadline to partnership tax returns for 2017. *Keep in mind that after Oct. 15, the IRS will no longer accept an electronically filed tax return. After this deadline, you must mail in your tax return in order for it to be processed. 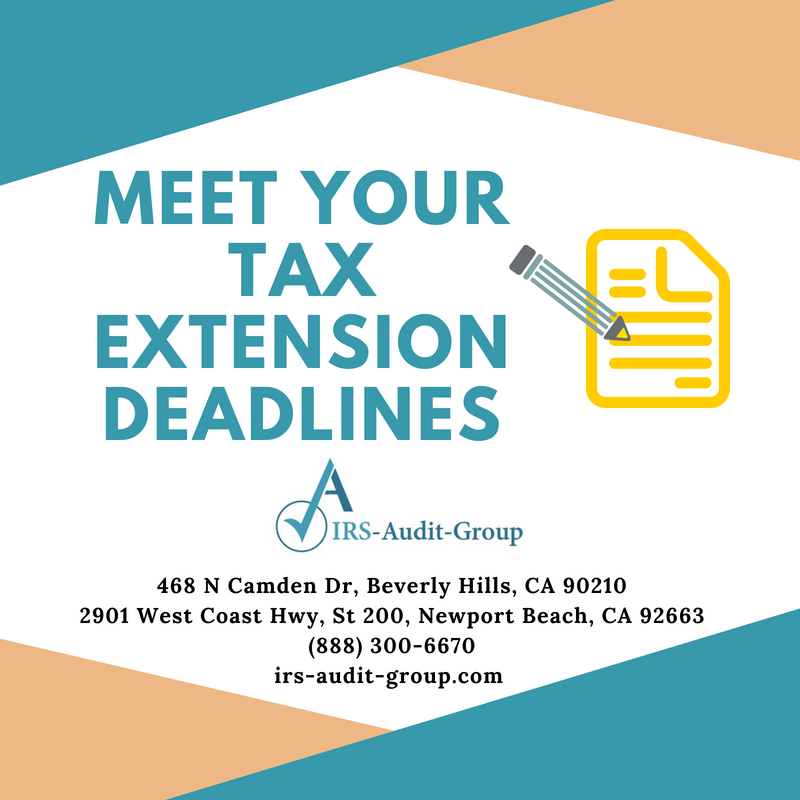 We are hoping this gives you enough advance notice so you can get started on necessary preparation to meet these deadlines, don’t panic if you missed any of them or aren’t on track to get everything in order by then … simply contact our team at IRS Audit Group for immediate assistance. Schedule a free consultation to review your documents and determine the quickest solution to be sure you take action and resolve any outstanding matters. While your chances of going to jail or facing an audit are slim, the IRS always prefers immediate action, whether you haven’t filed yet or still owe taxes. You may face financial penalties, however, including interest, but this can all be taken care of with an installment agreement. So if you’re worried about paying a lump sum in one sitting, the IRS offers alternative options that work for your budget, as long as you qualify. Contact us if you are having any other issues with the IRS. We can help with countless services that involve tax problems throughout the country. With offices in Newport Beach and Beverly Hills, IRS Audit Group professionals are knowledgeable and experienced in assisting those who need additional guidance when filing taxes.